Occasionally I have the opportunity to give high school students an introduction to research in a university context. 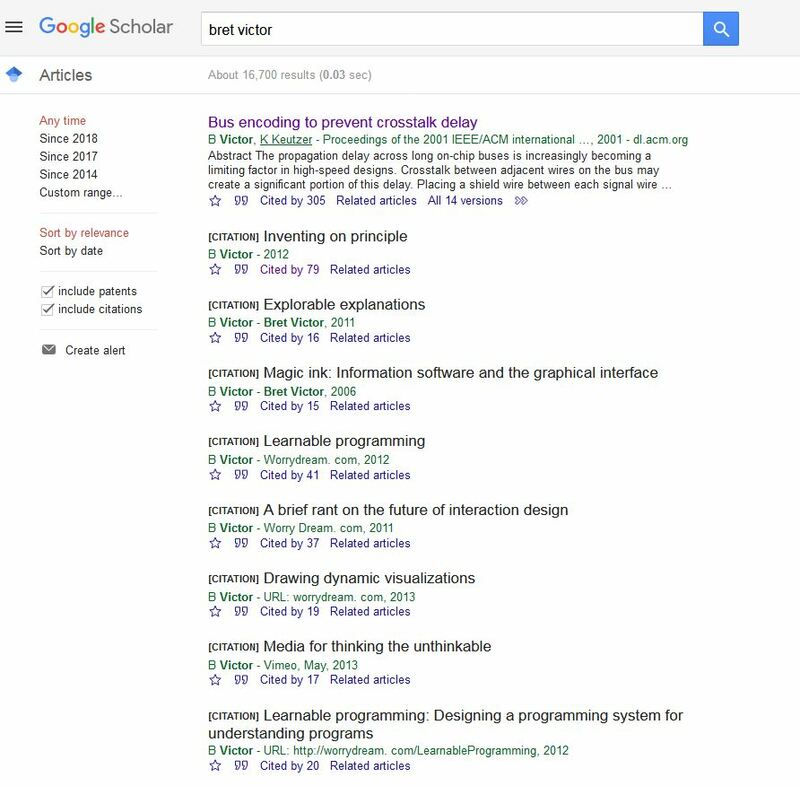 During this introduction I show them an example of a ‘scholarly paper’ so they can take in the visual cues that might help them recognize other scholarly papers in their future. 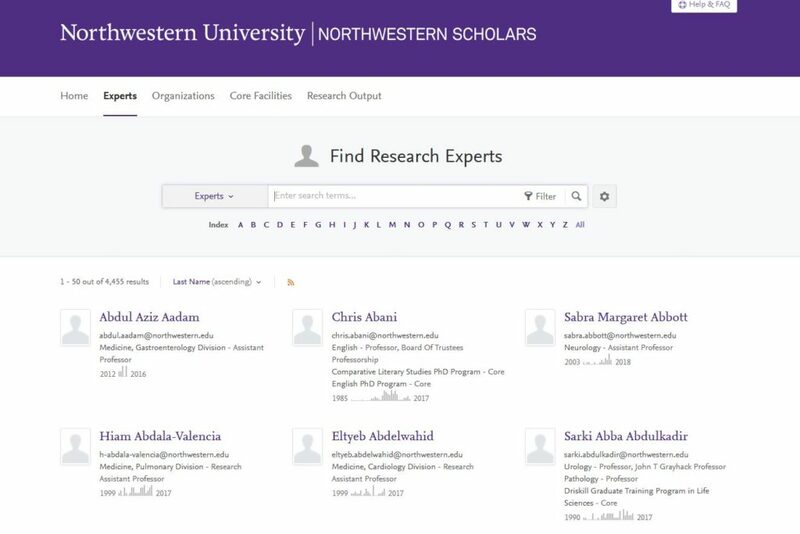 I tell the students that this article has a unique identifier number called a DOI and that there is a system called CrossRef that tracks how many bibliographies where this number appears. And then I scan the faces of the room and if I don’t see sufficient awe, I inform the class that a paper’s ability to express its own impact outside of itself is forking amazing. The ability to make use of the CrossRef API is reserved for CrossRef members with paid memberships or those who pay for access. This means that individual researchers cannot make use of the CrossRef API and embed their own citation counts without paying CrossRef. The image above is from the end of Bret Victor’s CV. I like to think that the library is a humane medium that helps thinkers see, understand, and create systems. As such, I think librarians have much to learn from Bret Victor. Bret Victor designs interfaces and his thinking has been very influential to many. How can I express the extent of his influence to you? Bret Victor chooses not to publish in academic journals but rather opts to publish his essays on his website worrydream.com. The videos of some of his talks are available on Vimeo. It is an accepted notion that the normative view of science expounded by Merton, provided a sociological interpretation of citation analysis in the late 1960s and 70s. According to his theory, a recognition of the previous work of scientists and of the originality of their work is an institutional form of awarding rewards for efforts. Citations are a means of providing such recognition and reward. The above is the opening paragraph of, “Why hasn’t Latour’s Theory of Citations Been Ignored By the Bibliometric Community? Discussion of Sociological Interpretation of Citation Analysis” by Terttu Luukkonen. Latour’s theory has an advantage over that of Merton’s in that it can explain many of the findings made in the so-called citation content and context studies mentioned. 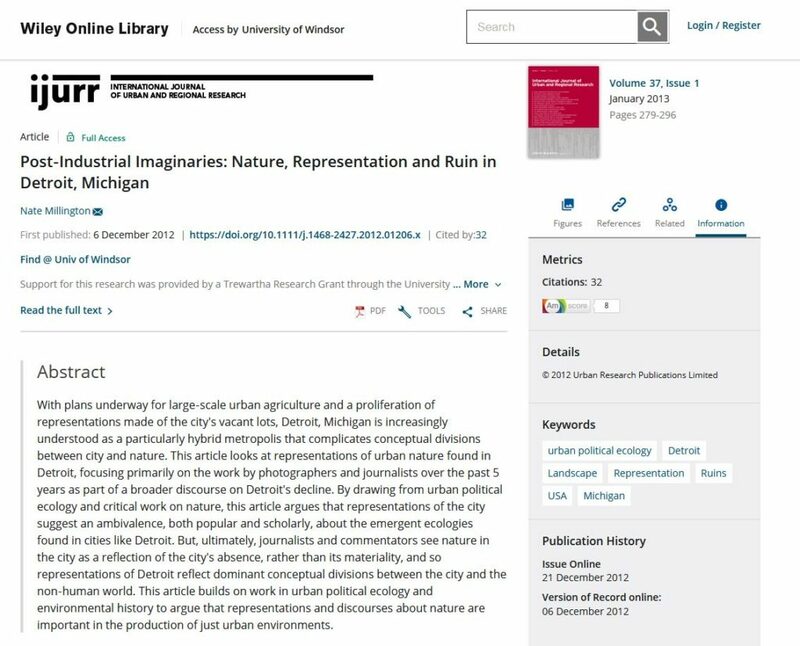 These findings relate to the contents of citations, which are vastly different and vary from one situation to another; also the fact that the surrounding textual contexts in which they are used differ greatly. Such differences include whether citations are positive or negational, essential to the references text or perfunctory, whether they concern concepts or techniques or neither, whether they provide background reading, alert readers to new work, provide leads, etc. The above passage is from page 29 of the article. The Latourian views have been largely ignored by the bibliographic community if their discussions about citations. The reasons why this is so are intriguing. An important conceptual reason is presumably the fact that in Latourian theory, the major of references is to support the knowledge claims of the citing author. 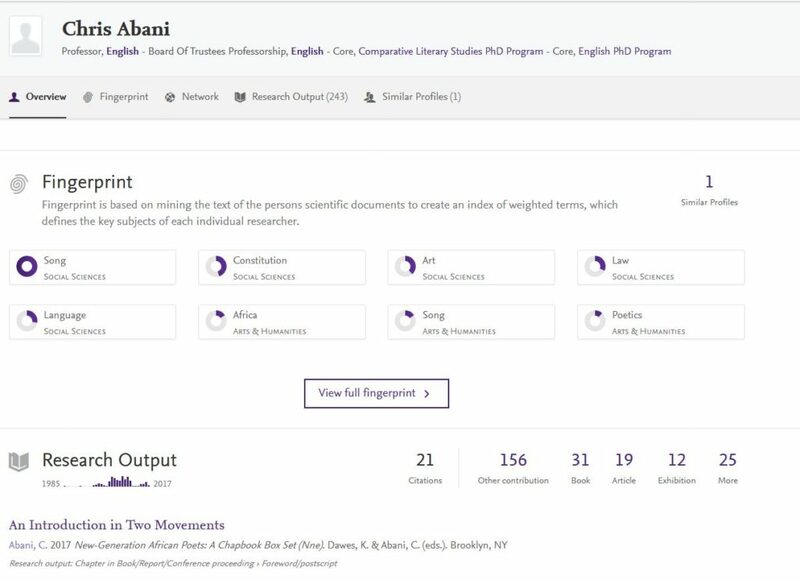 This explanation does not legitimate major uses of citation indexing, its use as a performance measure – as in the use of citation counts which presupposes that references indicate a positive assessment of the cited document — or as an indication of the development of specialties – as in co-citation analysis. You may have heard of Bret Victor just earlier this week. His work is described of in an article from The Atlantic called The Scientific Paper is Obsolete. Here’s What’s Next. 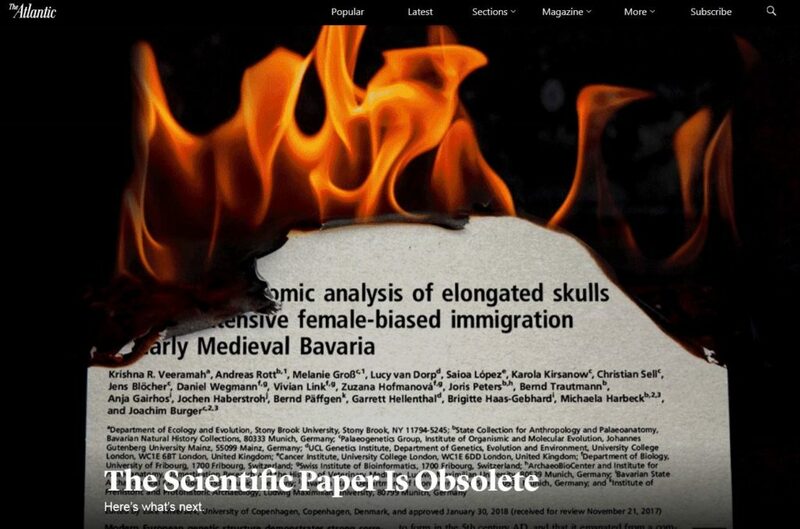 The article goes on to present two software driven alternatives to the PDF paper-mimicking practices of academia : notebooks from private company Mathematica and open source Jupyter Notebooks. Perhaps it was for length or other editorial reasons but the article doesn’t go into Bret Victor’s own work on reactive documents that are best introduced by his self-published essay called ‘Explorable Explanations‘. There is a website dedicated to collecting dynamic works inspired by Bret’s essay from Nicky Case, who has created some remarkable examples including Parable of the Polygons and The Evolution of Trust. The more people believe in a statement and use it as an unquestioned fact, as a black box, the more it undergoes transformations. It may even undergo a process which Latour calls stylisation or erosion, but which Garfield called obliteration by information, that is, a scientist’s work becomes so generic tot he field, so integrated into its body of knowledge that people neglect to cite it explicitly. At the end of 2013, Bret Victor published a page of things that ‘Bret fell in love with this year’. 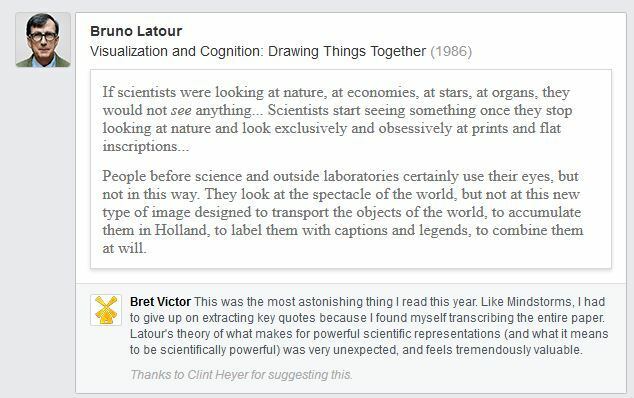 The first item on his list was the paper Visualization and Cognition: Drawing Things Together [pdf] from French philosopher, anthropologist and sociologist, Bruno Latour. One example will illustrate what I mean. La Pérouse travels through the Pacific for Louis XVI with the explicit mission of bringing back a better map. One day, landing on what he calls Sakhalin he meets with Chinese and tries to learn from them whether Sakhalin is an island or a peninsula. To his great surprise the Chinese understand geography quite well. An older man stands up and draws a map of his island on the sand with the scale and the details needed by La Pérouse. Another, who is younger, sees that the rising tide will soon erase the map and picks up one of La Pérouse’s notebooks to draw the map again with a pencil . . .
What are the differences between the savage geography and the civilized one? There is no need to bring a prescientific mind into the picture, nor any distinction between the close and open predicaments (Horton, 1977), nor primary and secondary theories (Horton, 1982), nor divisions between implicit and explicit, or concrete and abstract geography. The Chinese are quite able to think in terms of a map but also to talk about navigation on an equal footing with La Pérouse. Strictly speaking, the ability to draw and to visualize does not really make a difference either, since they all draw maps more or less based on the same principle of projection, first on sand, then on paper. So perhaps there is no difference after all and, geographies being equal, relativism is right. This, however, cannot be, because La Pérouse does something that is going to create an enormous difference between the Chinese and the European. What is, for the former, a drawing of no importance that the tide may erase, is for the latter the single object of his mission. What should be brought into the picture is how the picture is brought back. The Chinese does not have to keep track, since he can generate many maps at will, being born on this island and fated to die on it. La Pérouse is not going to stay for more than a night; he is not born here and will die far away. What is he doing, then? He is passing through all these places, in order to take something back to Versailles where many people expect his map to determine who was right and wrong about whether Sakhalin was an island, who will own this and that part of the world, and along which routes the next ships should sail. Science requires a paper to be brought back from our endeavours. What else is software but writing on sand? I wanted to highlight Bret Victor’s to my fellow library workers for what I thought were several reasons. But the more I thought about it, the more reasons came to mind. But I don’t want to try your patience any longer so consider this a potential beginning of a short series of blog posts. More and more of our academic institutions are making use of Pure and other similar CRISes that create profiles of people that are generated from the texts we write and the citations we make. Despite Latour, we are still using citations as a performative measurement. I think we need a more humane medium that helps thinkers see and understand the systems we work in.